The iPad is a product that cries out for a case, especially if you want to prop it up at the right angle for reading or typing. 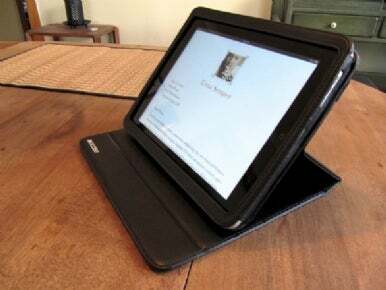 I've had a chance to test drive the $60 Incase Convertible Book Jacket for iPad, and have liked what I've seen so far. 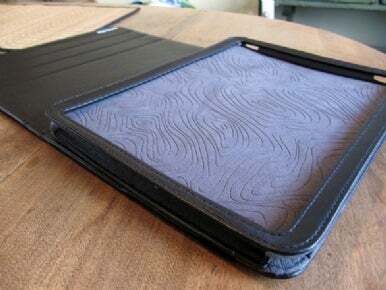 This leather case feels sturdy and fits snugly without making it too hard to insert or remove the iPad. But whether this case will appeal to you probably depends on how you perceive the iPad: Is it a hand-held media viewer? A giant PSP-killing iPod touch? Or a super slim notebook replacement? If you think it’s more of that last one, this case might be a good candidate. The Convertible Book Jacket is designed to prop up the iPad in three different landscape orientations. This is ideal for using its on-screen keyboard or a bluetooth keyboard to input a lot of text into Pages, chat apps, or a blogging client. It can also turn your iPad into an adjustable photo frame or portable movie venue. The Convertible Book Jacket’s propping strength lies in the three notches on the inside of its cover. The idea is that you open the case and lay the cover flat, then lift the iPad compartment up to rest its bottom edge in one notch or another, depending on how much of a viewing angle you need (I demo this system in the video below). It’s not quite the fine display adjustment mechanism you get with a notebook, but it goes a long way towards the notebook replacement goal that some people have for the iPad. One drawback of this all-leather case and the notched propping design, however, is that the system feels a tad weak. Leather creates some decent friction to support the iPad when used this way, but as you can see in the demo video below, heavy typers may need to look elsewhere, or simply rely on an external keyboard. If you press on the screen too hard, the case give a bit, which is probably best seen in the most horizontal of propped angles. It also means that the iPad may slip out of its notch every once in a while, forcing you to re-set it more often than you’d like. I’m already used to lightly pressing on this case, though. After all, it’s not like you get any more oomph out of slamming on an iPad’s virtual keys, so it wasn’t hard to develop one more new habit for testing this case in the iPad lifestyle. The other potential drawback I’ve noticed after some brief tinkering with this case is that it is designed entirely for the propped-up scenario. Unlike Apple’s single-stage iPad Case prop design, the Convertible Book Jacket cover is not really designed to be opened and wrapped back around the case for carrying around or reading a book on the couch. Fortunately, it’s much easier to get your iPad out of this case versus Apple’s, so it’s easy to go hands-on when you need to. Overall it’s a good case. But I’m still not sure whether I want to use a case like this at all, or find something like the Crabble stand for iPhone for when I need to prop up the iPad and enter a lot of text. I love using a naked iPad, but I need an easy way to prop it up when the typing pedal must hit the metal. Of course, I’ve only used the Incase Convertible Book Case intermittently over the last couple of days, and the iPad is still a very new gadget that I’m wiggling into my daily usage. I’ll see how things go. Stay tuned to Macworld.com for reviews of a whole bunch of iPad cases, coming soon.